My son and I are very excited to have discovered the Canadian Flyer books. 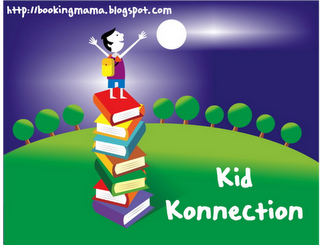 Book 2 deals with a topic that my son is crazy about: dinosaurs! Emily and Matt are once again transported back in time on an antique red sled called the Canadian Flyer, which takes them to a different part of Canada at a historic point in the past. It happens when they hold an object (this time it's a dinosaur egg from the late Cretaceous period) taken from an old dresser full of strange items in the tower of Emily's house. The object they choose determines where they will travel to next. 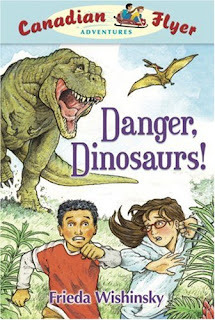 There are funny moments in this book as well as heart-stopping near-escapes when Emily and Matt are being chased by dinosaurs, especially the T-rex! Although we know a lot about dinosaurs we learned new things and also the names of Canadian paleontologists and the dinosaurs they discovered. Unlike the first book, there didn't seem to be a mission or purpose to their visit to the past, apart from learning dinosaur history. Emily was whiny and wanted to go back home, but Matt loved seeing the dinosaurs live and the sled would not allow them to go back yet. At one point in the story, Emily angrily stomps off on her own and gets into trouble. She is rescued by Matt and they escape back to the present just as more danger appears. My six-year-old son pointed out to me that Emily and Matt had to work together to get away safely. I guess he was trying to say that the moral of the story was co-operation. Well, at least he picked up on this quicker than I did! He really liked this adventurous story of going back to the times of the dinosaurs. If you have a dino lover in your home, they are sure to like this action-filled adventure of two kids who travel back to the Cretaceous period when giant creatures roamed the Earth and filled the air with their terrifying roars. This book is printed on 100 % post-consumer recycled paper: Ancient Forest Friendly. These books look great. My son isn't a huge dinosaur fan, but he did bring home a book from the library about dinosaurs!